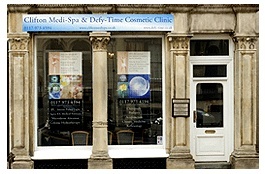 Defy Time's Dr Alan Wyn Jones now runs a regular Cosmetic Clinic at Clifton Medi Spa. With a desire to expand on their health and beauty services, Clifton Medi Spa has partnered with Defy Time to fulfil an extensive range of cosmetic treatments. Now, in addition to their traditional services of Podiatry, Acupuncture, Colonic Hydrotherapy, Remedial Massage, Reflexology and Laser / IPL (owner of Clifton Medi Spa, Mr Eirian Jones, is a trained Healthcare commission Laser / IPL practitioner), Clifton Medi Spa now provides a full range of cosmetic treatments including: Botox; Dermal Fillers; Sculptra; Peels; Amelan and many others. Since working at Clifton Medi Spa, Dr Jones has quickly attracted a large number of cosmetic clients and plans are afoot to run additional surgeries in the near future.